Following an unexpected and protracted delay, the current issue of Romantic Textualities brings into focus further interactions between Romantic literature and contemporary print culture. The two articles and one report offer illuminating explorations into the hinterland of popular discourses of the period—notably, the cult of the poetess, the sporting world, and trade gothic. In his essay, David Moberly examines more closely the work of poet Maria Pickersgill, who as the wife of the painter Henry William Pickersgill offers a perspective onto the artistic world of Romantic England. Maria’s work provides a complex and nuanced engagement with this world, both benefiting from and criticizing it in her published works. As well as managing matters for her busy husband, Maria Pickersgill had an artistic life and career of her own, publishing a large corpus of poetical works. Nevertheless, as a woman poet, Maria Pickersgill was marked by a struggle for recognition within a literary establishment that itself limited women. Moberly’s essay provides an engaged and persuasive analysis of Maria’s poetry, and its reflections on performativity and gender, particularly through her use of orientalist framing devices, which can be contrasted with those of contemporaries such as Moore and Byron. David Snowdon’s essay complements Moberly’s by looking at the masculine sporting culture that flourished in the 1820s, revolving in particular around the boxing world dubbed ‘The Fancy’. Focusing on the 1821 prizefight between Tom Hickman and Bill Neate, Snowdon examines the ways in which the event was depicted by the pens of William Hazlitt, Pierce Egan, and John Badcock. An extended discussion of the popular Boxiana series, which was first written by Egan, and then taken up by Badcock, before legal proceedings allowed Egan to publish once again under the Boxiana imprint. As well as looking at the key commentators on the event, Snowdon’s article also provides detailed profiles of the boxers who caught so much attention, especially the volatile Hickman. Deconstructing the personalities and the language behind these narratives, Snowdon considers the image of Hazlitt as an interloper into a ‘flash’ world who managed to remain firmly fixed within the literary establishment, while central commentators like Egan and Badcock were pushed to the margins of respectability. Jacqueline Howard’s lengthy report puts forward the tantalising—and, no doubt, controversial—view that Ann Radcliffe’s career as a novelist did not stop with the publication of The Italian (1797). Based on close textual and contextual analysis, Howard argues that Radcliffe went on to issue two further, anonymous novels through the Minerva Press: Lusignan, or the Abbaye of La Trappe (1801) and The Orphans of Llangloed (1802). The report identifies a number of clear elements that are not only ‘Radcliffean’ in nature, but can be seen as Radcliffe’s. The report provides a number of comparative readings betweeen Radcliffe’s writings and these anonymous works that substantiate its author’s claims. Extensive attention is given to other facets, tropes, and themes shared between these works, to further substantiate the contention that Radcliffe’s sudden disappearance from the scenes of gothic writing can be explained by her continuance through anonymity. 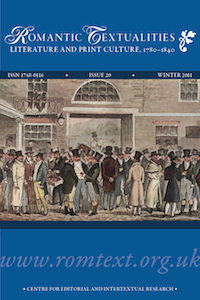 The issue concludes with a collection of reviews on publications relating to Romantic-era literature, intertextuality, and print culture, beginning with a review essay on two recent books that analyse the ideological landscape of England and Scotland. This is followed by shorter reviews of studies of nineteenth-century medievalism and its reconstruction by women writers; a new edition of James Hogg’s The Mountain Bard; monograph studies on religion, and its role in the work of John Clare and as it relates to the gothic; and examinations of nineteenth-century literary tourism. Following the reviews is an updated list of ‘Books Received’ for review by Romantic Textualities, which enables interested readers and potential reviewers to view a various print-culture related works that are available for review in future issues of the journal. In addition to the various elements that make up this issue, there a few other matters worthy of note. Romantic Textualities now enjoys a much ‘friendlier’ alias on the internet, and can be accessed via www.romtext.org.uk. The journal is supported by a regularly updated blog, which will contain other items of interest that relate to history of the book and print culture in the Romantic period, written by a variety of contributors. Researchers working with visual objects such as illustrations, ceramics, photographs, etc. may be interested in our soon-to-be-launched Digital Image Curation Environment (DiCE)—an open-source, freely available application that allows users to catalogue and describe their own image collections, which can be viewed at high levels of magnification. More information is available at www.d-i-c-e.org.uk or www.dmvi.org.uk/dice. Finally, a brief word about the upcoming issues of Romantic Textualities: the next two numbers will focus on ‘Romantic visual cultures’, and are due to be published in mid 2013 and early 2014.